Recently, a group of Italian researchers conducted an underwater Doppler echocardiography study of 18 healthy scuba divers titled “Cardiovascular changes during SCUBA diving: an underwater Doppler echocardiographic study.” The rationale for the study was a concern that body immersion, which induces redistribution of blood from the periphery to the chest, may adversely affect subjects with previous heart disease. 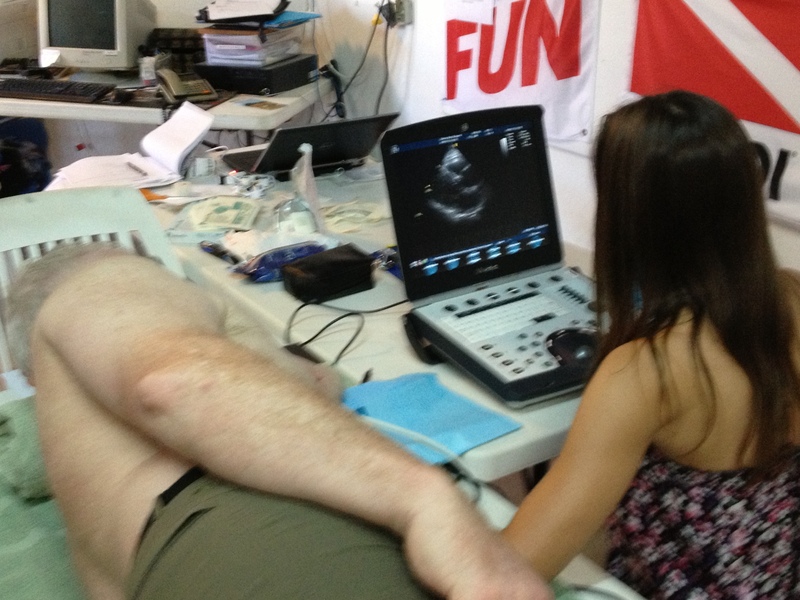 The aim of the study was to evaluate cardiovascular changes during immersion using underwater Doppler echocardiography. They found that the left ventricle is enlarged during immersion, an effect that is expected because there is more blood moving into the chest area. In addition, there were some changes in the velocity of the ventricle filling measured, but the significance of this is not clear. These changes were still noticeable when the Doppler echocardiography was repeated immediately after a dive; however, some older studies reported that most changes disappeared within one hour after the dive. Please note, although the motivating concerns for the study were about divers with pre-existing cardiovascular conditions like hypertension and coronary heart disease, the study involved 18 healthy subjects. While there are quite a few papers that report temporary changes in cardiovascular functions in healthy divers, there are no studies exploring how these temporary changes may acutely affect divers with pre-existing conditions or how long these changes may persist in such divers. DAN is conducting a study that aims to provide more answers. Cardiac function is evaluated by echocardiography after multiple days of diving. Possible arrhythmias are monitored with a continuous underwater electrocardiogram (ECG) using a specially adapted mini Holter recorder. We just conducted our first field study involving 25 volunteers and plan to do five more trips to study up to 120 divers by the end of 2014. Photography and post by: Petar Denoble, MD, D.Sc. Wow. Interesting news. I would really like to know how this relates to aortic stenosis and what happens to the heart. Too bad you’re not in my area. I would volunteer. I am an “aging” CRNA (59) and diver, and follow the new data as i encounter it. I also have an unusual arrhythmia (PAT with swallowing) that is not exercise induced. My diving is shallower and less vigorous than in the past. I’ve had a stress echo, which was entirely normal, and i always disclose my arrhythmia when diving. Thank-you for educating us all!